Acknowledging the dedicated service they provided to the United States of America during World War II, the Congressional Gold Medal was presented Wednesday, November 2, 2011, to members of the U.S. Army’s 100th Infantry Battalion (INF BN), the 442nd Regimental Combat Team (RCT) and the Military Intelligence Service (MIS). These individuals, also known as Nisei Soldiers, were given the highest honor that the U.S. Congress can bestow during a ceremony held in the Capitol Visitor Center’s Emancipation Hall. The United States Mint also made available Nisei Soldiers of World War II Bronze Medals that are reproductions of the actual Congressional Gold Medal. The United States Mint also made available bronze medals that are reproductions of the Congressional Gold Medal. These bronze medals may be purchased directly from the Mint. Nisei is a Japanese term used to describe second-generation Japanese born in the United States (as well as other countries). The individuals honored during the ceremony were Nisei and fought for their country while many of their family members were interred in war relocation camps. "Granting this medal is a long overdue honor which recognizes and expresses our utmost appreciation for your dedicated service in the U.S. Army during World War II," stated U.S. Senator Barbara Boxer during the ceremony. "You fought World War II on two fronts. As President Truman said, ‘You fought not only the enemy … you fought prejudice and won’." Nisei Soldiers served the country with distinction during the war, eventually becoming the most highly decorated regiment in the history of the United States. Twenty one of its members were awarded the Medal of Honor for their actions. 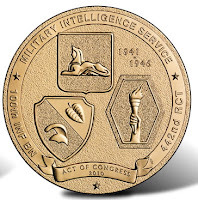 Shown on the reverse of the medal is a design by United States Mint Sculptor-Engraver Don Everhart. It depicts the insignias of the 100th Infantry Battalion, the 442nd Regimental Combat Team and the Military Intelligence Service. The 100th INF BN insignia features a taro leaf and a traditional Hawaiian helmet — emblematic of the unit’s Hawaiian roots. The "Go for Broke" Torch of Liberty shoulder patch represents the 442nd RCT while a sphinx, a traditional symbol of secrecy, represents the MIS insignia. Reverse inscriptions include the titles of the honored groups: 100th INF BN, 442nd RCT, and MILITARY INTELLIGENCE SERVICE. A decorative ribbon contains the inscriptions of ACT OF CONGRESS and 2010. 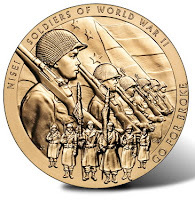 The Nisei Soldiers of World War II Congressional Gold Medal was authorized by Congress with the passage of Public Law 111-254. That same law authorized the Secretary of the Treasury to strike and sell three-inch and one-and-one-half-inch bronze reproductions of the medal. These reproductions are currently available directly from the US Mint for $44.95 and $7.95, respectively.